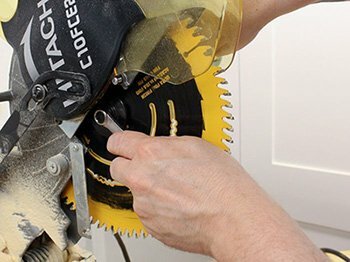 When you use your miter saw, you can easily tell when it is time to replace the blade. Some of the indicators are burn marks on the workpiece or when there is excessive chipping. 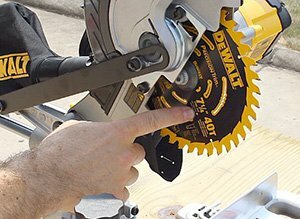 The process of changing the blade on a miter saw is relatively easy. You will just need a few tools and you should be back to the cutting within a short while. 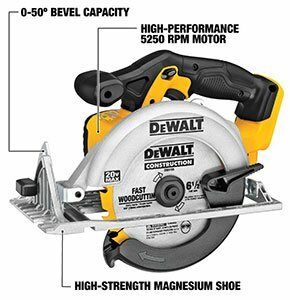 You can check out our guide to buy the best miter saw blade. Every miter saw comes with a manual that you can use to change the blade. This is the best way to ensure that you have everything done in the right way. In addition, this will help you to find the right blade for replacement. In this guide, I will show you some simple steps that you can follow to change the blades like a pro. Why Change Blade on a Miter Saw? A dull blade is one of the main reasons you would want to change the blade. When the blade is dull, it does not produce quality cuts. There are different types of blades that you can get, all you need to do is ensure that you have the right blade for the specific project. 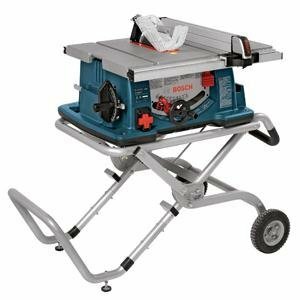 The miter saw is quite versatile and as such you will use if to cut different materials. You will need to change your blade to cut different materials. 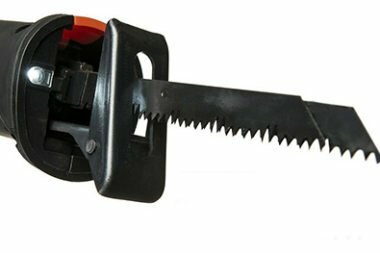 There are some saw blades that are designed to work in specific materials. You will need to cut wood with a particular blade, but when you need to cut metal, you will have to change the blade. Another reason why you need to change the blade on your miter saw is to achieve different cuts. Blades come in different designs and teeth arrangement. The blades that have more teeth will work great when you need to produce clean and crisp cuts. The ones with fewer teeth, on the other, had will be useful for rough and choppy cuts. 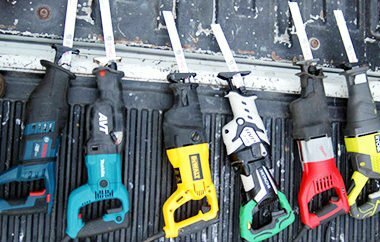 For DIY projects, the blades with spaced teeth may be the best. Having established some of the key reasons why you will be forced to change the miter saw blade, we can now get into the process. Remember that you should first look at the manual of the specific model that you have so as to get this done in the right way. This is due to the fact that there are different models of the miter saw, with different features. 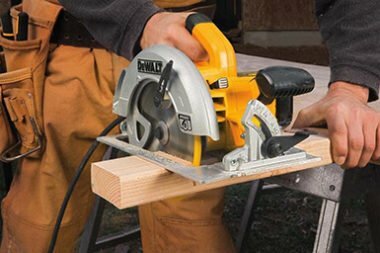 The first step is to make sure that your miter saw is removed from the power outlet. You should press the trigger several times so as to be sure that you have unplugged the right tool. When this is confirmed, you should loosen the screws that hold the blade guard in place. As soon as the screws are loose, you can use your hands to remove the blade guard. At this point, you will need to press the spindle lock to secure the blade of the miter saw. Confirm that the lock is secure when you are doing this. The location of the lock will vary depending on the model that you have. In most cases, it will be at the front or the end of the housing. The black button should sink all the way down when the blade is locked. To remove the blade, use an Allen wrench to turn the bolt holding the saw. Turn it in the clockwise direction and this will loosen it. Remove the outer washer of the blade and this is something that you will use your bare hands to do it. You should not remove the inner washer. When it gets to the actual replacement of the blade on a miter saw, you need to consult the owner’s manual. This will show you the right blade and the specific instructions to follow. However, in general, you will need to apply small drops of oil on the washers, using a clean washcloth. This will enhance the lubrication of your saw and improve the functionality of the saw. The blade should be installed with the teeth facing downwards. When the blade is installed in the wrong way, this can cause serious injuries. When the blade is put in place, replace the outer washer and tighten it with your hands. Use the Allen Wrench to tighten the bolt in the counterclockwise direction. Ensure that the blade is tight enough to prevent any accidents. Use a screwdriver to reattach the blade guard and lower it on the miter saw. Always refer to the owner’s manual when using the miter saw, so as to familiarize with the tool. 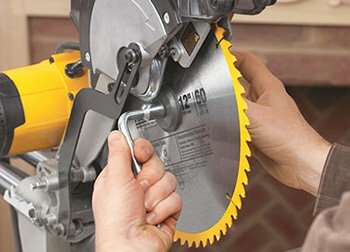 Before making any adjustments on the saw, ensure that the saw is turned off and disconnected from the power source. You should always wait for the blade to come to a complete stop before attempting any changes or adjustments on your saw. Never touch a blade with bare hands after immediate use, as it is usually very hot and can cause serious burns. As mentioned earlier, the process of replacing the blade on a miter saw is not complicated. This is something that everyone with this tool needs to know. It does not matter the model that you have, you will need to replace the blade at one point or another. With this guide, you should be able to go through with the process without any problems. However, I cannot overemphasize that you need to pay keen attention to the manual provided by the manufacturer. I have given you the general steps in replacing the miter saw blade. The owner’s manual, on the other hand, will give you specifics, which may vary slightly from model to model.